AFM Members: Please be aware that recording sessions contracted by CMG MUSIC RECORDING (alternatively known as Collective Media Guild) are non-union engagements with no union contract protections. 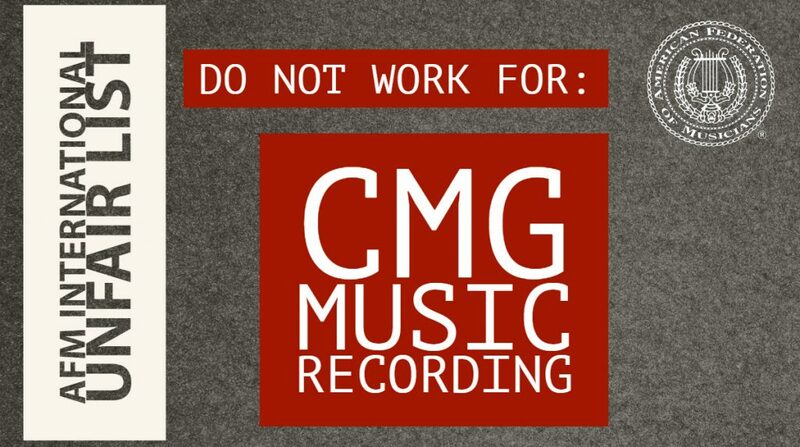 CMG Music Recording is currently under investigation by the California Labor Commissioner for exploiting musicians by undercutting fair industry standards. CMG Music Recording appears on both the AFM Local 47 Do Not Work For List and on the American Federation of Musicians International Unfair List. Per AFM bylaws, members shall not render musical services for organizations, establishments, or people who have been placed on the International Unfair List, or for their principals. All musicians deserve to earn a fair wage and benefits in line with industry standard. By making orchestras available for dirt cheap, employers come to expect bargain rates that undermine musicians’ ability to pay their bills. We recommend that AFM members not participate unless a fair union contract is in place. A large orchestra is currently being contracted for a dark session at the end of November. Members contacted to record with CMG Music Recording (Jennifer Biggs Walton and/or Karen Garrity) are encouraged to alert AFM Local 47 EMD Administrator Roxanne Castillo at 323.993.3143. BFD……..Work is work you money grabbing morons! Welcome to the Free Market! There is more non-union talent in LA than 1/2 of your membership so AFM should be afraid of organizations like CMG who hire the best at a fair wage no matter what their affiliation….PERIOD!